A wandering solitary viking. Yea, with a helmet he stole from Cortez :P . So did I size the pictures right? Few beyond the slopes of Mt. Luna have ever seen King Basil in person, but all have heard rumors of his unforgiving nature and cunning intellect. A proud high elf warrior, this spearman protects Ellyria from hoards of orcs, barbarians and drows. 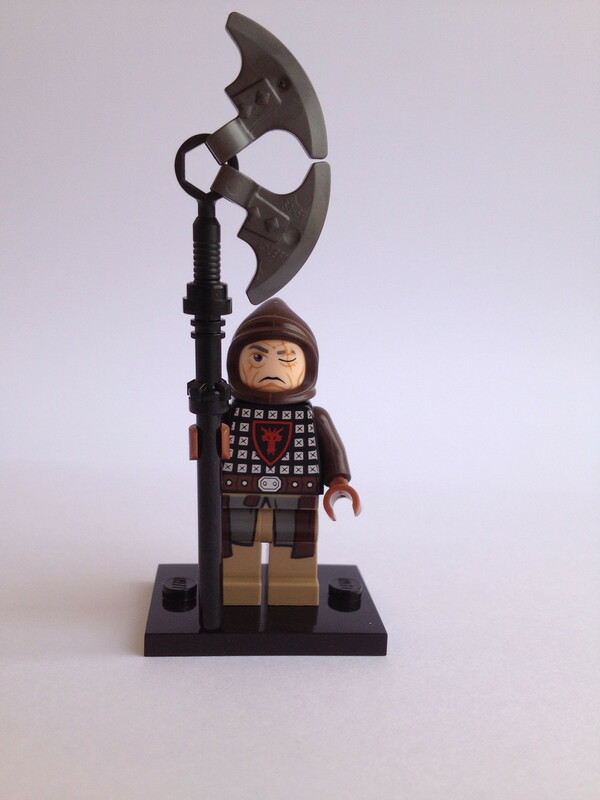 Equipped with a cuirass, a tall helm, a shield and a spear, he makes a big threat to any attacker. The mighty dwarf, Gotrek Son of Gurni, is one of the most well known members of the Slayer cult of Grimnir. Being dishonored by a deed long past, he adventures around the Warhammer world, seeking an enemy strong enough to give him a good death, thus allowing him to enter the Hall of Ancestors (pretty much dwarf Valhalla). His traveling companion, Felix Jaeger has sworn to record his epic doom in a poem, but is also determined to learn the dwarf's story. Gotrek doesn't speak of his past, and is quick to anger, no one really knows why he became a slayer. His weapon, is an ancient dwarf-forged rune axe of a bygone age, who's power has slowly turned Gotrek into a near invincible combatant, he is slowly becoming depressed as he can't find an enemy strong enough to defeat him. Although he was once a fierce warrior, injuries have kept him out of battles for several years. His desire to kill forced him to find a new job he was able to do. When the wartime comes, many men seek their fortune and a chance of glory and join the royal forces. This man, having some skill with his crossbow, buys himself a kettle helm and a leather vest with his joining wages and prepares to move out with the army. Known by many names- Redmayne, Direwolf, The Red Swordsman, to name a few, Hollis Archenwell is a swordsmaster with skills bordering on the divine. His ability with the sword is so extensive that any who witness it consider it to be a form of magic. A member of the Lenfel Emerald Wolves Mercenary Company, Hollis holds the unique rank of Direwolf, and works alone, on missions of special importance. Despite this, no member of the company has ever witnessed his skills in action. Whether he is merely a fraud, or the company is deliberately maintaining plausible deniability to skirt the laws concerning potential magicians remains to be seen. Cape is removable, figure is fully pose-able. Living in a vast forest, deep in Northern Mitgardia, this hunter lives off what he can find to survive. Lots of experience has taught him how to act and look like an animal himself, allowing him to lure his prey right to him. At the age of fourteen Edward III came to the throne following the invasion of his father's (Edward II) Kingdom by none other than his mother Isabella (wife of his father!) and Roger Mortimer. His father's reign had been a particularly bad time for England but the nation was transformed under Edward III. He has been called the 'Father of English Commerce' due to his encouragement of trade at home (England and Wales) and abroad. During his reign parliament gradually developed into a bicameral institution, composed of a House of Lords and a House of Commons. New Otrus, a major port city alongside the Yerr sea. Known for it's fish and it's fierce warriors. Occid, once lived along it's beautiful coast as a highly ranked and respected noble. When the king grew evil, Occid refused to do his bidding and now banished, he wanders the world fighting for good. My second entry into the custom castle minifig category. Only few have ever mounted a white bear and lived. Snaefellsness was the only exception known among elves and Baerenn was the only rider he accepted. After the battle of the northern plains, he was the first bear ever to be honored with the protective rune of Griss-Ly. "They are proud and willful, but they are true-hearted, generous in thought and deed; bold but not cruel; wise but unlearned, writing no books but singing many songs, after the manner of the children of Men before the Dark Years." Enter Scivik Wilde, accomplished swordsman and leader of Wilde Company, a roguish band of Lenfels who travel Roawia in pursuit of adventure, hunting monsters, saving damsels, defeating wizards and the like. Cape is removable, figure is fully pose-able. all we know is he's called "the Assassin"
A typical fighter in the Colosseum. Before joining the band of Robin Hood, Sir Percy enjoyed stalking small game in the king's forest to try his skill with the arrow. In the annals of Nortlen history, there is an ancient codex detailing the whimsical and fantastic Eastern Continent beyond the White Sea. On this continent in the grassy plains of Horruk, orc tribes contend for control over valuable resource-rich territories. From WIkipedia: "In the seventeenth and eighteenth centuries, some doctors wore a beak-like mask which was filled with aromatic items. The masks were designed to protect them from putrid air, which (according to the miasmatic theory of disease) was seen as the cause of infection." This brave Viking warrior is clad in the upper-class warrior's scale armor, an iron helmet, and wields a deadly battle-axe and broadsword, both signature weapons of the Viking raiders, as well as a heavy, yet protective, colorful wooden shield, which can be mounted on the side of a longship. So hopefully a custom sword, battle-axe, helm, and shoulder wrap(Thanks for the inspiration, |T|itus! :D) will be custom enough. Once again, inspiration to |T|itus and his fantastic custom minifgures! This is my first entry to the "Custom Minifgure" category of CCCXII over on Classic-Castle.